Presentations are available to Department of Pediatrics affiliates (with a HS/CS network logon). Teaching conferences are designed to provide the opportunity for an informal exchange of ideas among faculty, housestaff and students. The year begins with a series of Acute Care Conferences and continues with topics that include the subspecialties as well as general pediatrics. Most conferences are held during the noon lunch hour. Each workday begins with Morning Report when residents and faculty meet to review the patients admitted overnight to the wards and PICU. Following the evening’s “headlines”, the 2nd and 3rd year residents present a brief teaching case on a topic of their choice. Faculty and residents discuss the topic in a relaxed, informal atmosphere. 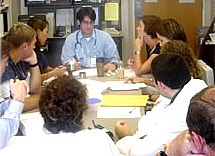 Physicians at the PL-2 and PL-3 levels are given the opportunity to attend a medical meeting during each year of their training.